UPDATE 5/1/15: The Hatbox Ghost will reappear May 9 in the Haunted Mansion at Disneyland park. You may remember our chilling challenge from a few months ago, in which we asked you to guess which spooky specter was preparing to materialize inside the Haunted Mansion at Disneyland park. Today, I’m excited to tell you that many of you were correct! The Hatbox Ghost is reappearing in May. Here’s a sneak peek! The Hatbox Ghost appeared in the Haunted Mansion for a short time around the opening of this classic attraction in 1969. Although brief, his presence sparked a decades-long following, and this reclusive resident of the Haunted Mansion was never forgotten. We’re excited that he will soon materialize once again! The magic that is Disney never ceases to amaze me. I am looking forward to being frightened prematurely by the Hatbox Ghost on my next visit to my favorite Haunted Mansion. For all of us UK and worldwide Disney and Haunted Mansion fans, please include the Hatbox Ghost at WDW! I’ve been hoping he might return for years but we only get as far as the east coast! What about the death certificates at the mansion? They did not have them a couple months ago? When in May? I’ll be there the 1-4th. Will he be there those days? I saw the ride is closed on May 4th. A second Hatbox Ghost was made for WDW some time ago, just never installed. Rumor has it he’ll make his appearance in Florida as well in the future. When in May?! I will be there in May and want to see him! When will dates and times to posted? How long will he be making an appearance? Want to make sure to plan a trip in that time… is it only May? I hope it’s not the one from D23. My fiance are staying one extra day on our honeymoon vacation just to meet him. He BETTER be there May 9th!!!! Lol. Erin– I assume that the Hatbox Ghost will be a permanent addition to the mansion? Brett– From what I understand, the hatbox ghost was removed shortly after the attraction’s opening because the effect (the character’s head disappearing from his body and reappearing inside the hatbox) simply did not work very well. YAY i am so happy that he is returning it’s about time i love hatbox ghost why did he go away in 1969 ? Did the Hatbox Ghost want to reappear for the Diamond Celebration…or did Guillermo del Toro sent a message to the Somewhere Beyond?? I always chuckle when I think about the Hatbox Ghost. When Imagineers installed the figure, they couldn’t get the effect to work convincingly because of technical limitations, but just three weeks earlier Apollo 11 landed on the moon. The Hatbox Ghost belongs in both parks! Disney even used his likeness for the East Coast March Magic Ghouls logo. Maybe it’s a message from beyond! Awesome! The Hatbox Ghost is definitely welcome to come home (or make his presence noticed again!) What a wonderful surprise for the celebrations this year! Can’t say enough how much I love Disneyland. OK, I really love Disney World too. Mickey rules! His smiling ‘face’ has always been in the Haunted Mansion in WDW. (The photos that are around the doors. Would love to see him in the attic…Would Love to see the original bride return. Please don’t put Hatbox Ghost in WDW. He was never there, therefore why would it make sense for him to return? He should remain a Disneyland exclusive! Is the scheduled closure at Haunted Mansion in the beginning of May in relation to him reappearing? Yep, he’s always been there, just not seen. YES, so excited to finally see him in person, so to speak. How exciting!! I was just telling my niece about the Hatbox Ghost! Will he be there to stay? Excellent; this will now have more meaning on our next visit when wearing my Hatbox Ghost T-shirt that Disney sold a while back. Thank you for confirming this old rumor. But why would they add a Hatbox Ghost to the Mansion out in Florida? There was never a Hatbox Ghost figure in that clone of the Disneyland attraction, so no need for him to “reappear” in a theme park he never existed in to begin with. The Hatbox Ghost is a Californian, born and bred. Disneyland’s Diamond Celebration is shaping up to be something special! I am thrilled that the Hatbox Ghost has received our sympathetic vibrations for the past 46 years and will materialize once again. Now I really need to get to Disneyland for the Diamond Celebration! Perhaps a Blog Meet Up to mark the occasion? Will he be there for the holidays?? I am hoping so! I was just wondering if he would be there during Haunted Mansion Holiday. Is this what the Haunted Mansion refurb is for from May 4-8? Meaning the Hatbox Ghost will be reappearing on May 9? I hope so, that is the last day of our trip! Heck Yeah! So Awesome and hopefully only Disneyland gets him, WDW doesn’t need him, they have ‘Other’ enhancements. Please Skip NBC so I can see this when I come later this year! For the love of ghouls, PLEASE bring him to Orlando! He’s all over the merchandise in the Magic Kingdom, and it’s silly that he has yet to make an appearance for Florida tourists. Help us out, guys! How long will he be there? Visiting in November. Mary, he’s been in the mansion all this time, just hiding. Great to hear it. Any chance he’ll also be appearing in Florida? Will he still be there in September? Is HMH overlay not happening this year with Diamond happening? Looks like my trip in May will be even more frightening. Plus it’s always good to have a new friend join all the grim grinning ghosts! I was there for the opening weekend it was there but the next time I was there it was gone. So it was one of original 999 happy haunts. 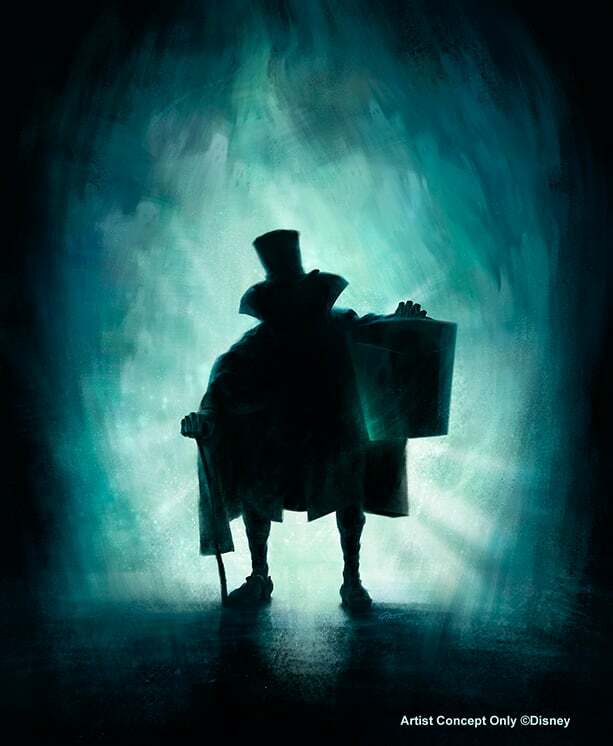 He was a cloaked figure with an evil grin.A hatbox hung from his hand.With each of his bride’s heart his head would disappear and reappear in the hatbox. NO WAY! This is so awesome! My sister and I (WDW addicts we are) have been planning a DL trip for years, and it’s finally happening in July! And this is the icing on the cake to an already awesome 60th celebration! I can’t wait! !